Is DualLiner Bedliner Installation This Simple? Yes, It Is! When we say 30 minute installation we aren’t kidding! DualLiner bedliner installation is a quick process and will be the best bedliner you will ever own. 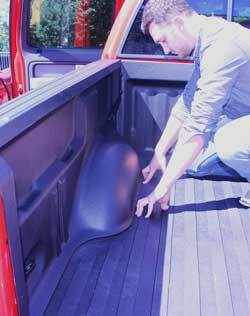 DualLiner provides maximum bed protection without damaging any part of your truck during installation. It also allows your bed to properly drain liquids and will prevent future rusting issues that may occur with other bedliners. The installation is extremely easy and can be done individually at the comfort of your home. 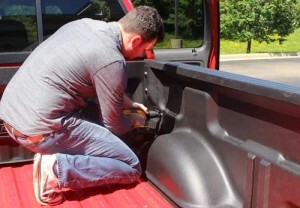 Here’s the step-by-step installation with photos, showing the DualLiner going in the bed of a 2011 Ford F-150 crew cab. You’ll appreciate the simplicity and ease of our component design, allowing your DualLiner bedliner to ship by UPS right to your door, instead of by expensive truck freight. Here’s a photo of the actual shipping box minutes after being dropped off by the UPS driver. From the moment you place your DualLiner order everything is made simple and convenient to the buyer. Your DualLiner is shipped FREE of charge anywhere in the Continental U.S. and delivered directly to your doorstep. It comes in a cardboard box that is delivered by your local UPS driver in just a couple days. Everything is organized into a small shippable box. 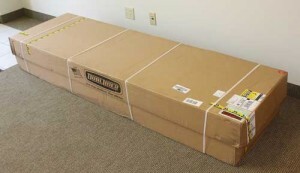 DualLiner provides FREE Ground shipping so your bedliner will be in your truck quickly. With most other types of bedliners you will either have to wait to have it shipped to you by truck freight, or you’ll need to find a professional have it properly installed, either of which may take over a week. When you open the box, the pieces are organized and very manageable. You’ll find a single sheet of paper on top, with instructions you’ll need to complete the installation process. The instructions are short, simple, and easy to follow. If you prefer, model-specific installation videos are also available HERE. With DualLiner you avoid the expensive shipping or service cost, and can do it yourself in a quick 30 minutes. And even though it is a simple installation you’re getting a highly-engineered bed protection solution that will last a lifetime, guaranteed. When we say “installation” of the load guard, it’s really just snapping it in place. Simple stuff! Installing the load guard (the part that goes against the cab) and sidewalls may seem like it would be difficult but it is really quite simple. The first step is installing the load guard against the cab of the truck. When we say “installing,” it’s just snapping the load guard into place. The load guard fits perfectly over the top wall of your bed and will fit snugly up against the wall of your bed, providing strong protection. The next step is installing both side walls. It is important to keep in mind that you must remove any cargo tie-downs from the inside walls of your bed before the sidewalls can be installed (we had four in our F-150). These can easily be removed with a power drill or socket wrench. Set the pieces aside for now in a place where you won’t lose them. After the side walls are in place you can re-install your cargo tie-downs. After the tie-downs are removed you are now ready to install the side walls. To start this installation, the side walls will slide underneath the pre-existing lip on the top edge of your bed walls. This will make the sidewalls fit as closely as possible to the truck to maximize the amount of room in your truck bed. After the walls are set in place, you can now connect the side walls to the load guard by tapping the pushpins through the manufactured holes in the DualLiner sidewalls and load guard. Once these pieces are connected, all that’s left to do to is secure the sidewalls with the cargo tie downs. Screw the cargo tie-downs back in to the sidewalls; they will fit snug and tight to the interior wall of your truck bed. You should only have two pieces left in your box at this point, a mat and the tailgate protector. The thick rubber mat provides excellent protection for your truck bed and simply snaps into the channel at the bottom of the side walls. Installing the rubber mat is next which is about as easy as it can get. The thick, heavy duty rubber mat is dropped into the bed and then snaps into channels in the bottom of the sidewalls that you just installed in the previous step. Your truck bed will be unharmed during the installation process, as most of the DualLiner simply snaps into place. Keep in mind that the ZeroSkid mat was rolled up for a while in the box when it was shipped to you. So don’t panic if you see a small hump in the rubber mat, it will flatten out in a day or two depending on the outside temperature. 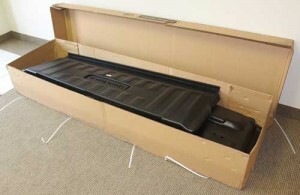 The mat will fit perfectly because it is made specifically for your truck model. The last piece left in the shipping box is the tailgate protector. The installation for this piece requires you to remove screws on the inside of your tailgate, and then place the protector against the tailgate and use the same screws to attach the protector. It will only take a few minutes. Once all the screws are in you have a decision to make, whether you want to drill into the tailgate to finish securing the tailgate protector or use the double sided tape that was included in the shipping box. Either choice will secure your tailgate protector and make it stay securely in place. Post Installation: Done Already? Yes! Thirty minutes later, when the tailgate protector is mounted, your installation is complete. Remember, if your mat is not lying flat, wait a few days, the mat flattens out over time and will fit snugly. The DualLiner bedliner will not only protect your truck, but will also make it look great for the lifetime of your truck. Now that you can see how easy the installation is, compare it to other methods of truck bed protection! DualLiner is the winner. But don’t just sit back and admire your work, it’s time to put your DualLiner ZeroSkid mat to the test. Fill your pickup’s bed with tools, stuff to haul, your off-road bike, or whatever you have, then grab your fellow truck buddies and show off your new DualLiner! Previous story Can A Simple Truck Bed Mat Protect Your Truck? Next story Bed Liner Secrets Revealed!